This same article has been around since at least 2012 and the telegraph in the UK later printed one about how it all just a faulty wire. I'm thinking this was some nerds idea of an April Fool's joke, eh? Have you thought about how fast darkness travel? For light to push darkness out something must be going in front of the light? You cant turn darkness on but you can turn light on.? So light is a stronger force or energy form than darkness as darkness cant elimanate light but light elimanates darkness? Just some thoughts that flow throught my brain which l think is faster than light ? Darkness is merely the absence of light such as cold is the absence of heat. What i wonder is, does the light appears as fast as it disappears? 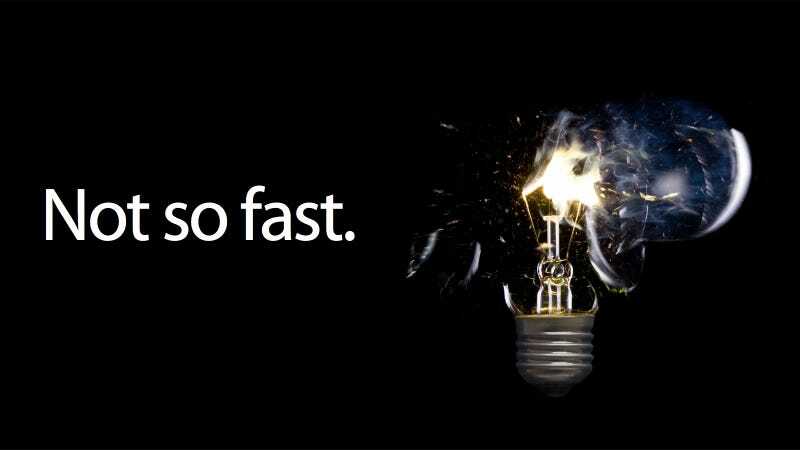 Dark is faster than light. No matter how fast light travels, dark is already there. Uh, no. Dark matter is already there until introduced with other matter such as light. The natural environment IS darkness. 65% of the universe is darkness , waiting, waiting, for an introduction, an infusion of light. Isn't that what he said? No, that's not what was said -- one implies that 'dark' is faster moving. The other state's that isn't that it's moving more quickly, but already present. Why does it have to be faster than something it wasn't competing with in the first place? It's hard to beat something already waiting at the finish line. If we're considering this in the above context anyways. If you have to explain it, you totally missed the joke. There are two kinds of darkness. One creates light and one bends it. Dark matter bends light and is pure density. Black hole. Antimatter creates light and is pure space. Aether. If the photon is traveling at a light frequency - that is, a sine wave - it's speed would be faster than 'light' which is measured in a straight line. The sine wave motion is up-down, that is, 90 degrees from the direction of travel, so in essence, the photon is not traveling faster than the speed of light . . . . it is light. Good thinking though, there is a correlation as to the strength of the signal, but no change in speed in the direction of travel. I think what he was trying to say is that if you measure a particle traveling the length of the waveform itself it's longer than the length travelled on the x axis, so a particle following this waveform would go farther than X in the same amount of time making it faster than light. Phil Watts, the possessive pronoun is spelled without an apostrophe: its, as in its speed... Only the abbreviated verb to be is spelled with an apostrophe: it's (from it is). Not an April Fool's Joke? Didn't he also invent the spellchecker? Note the keywords at the bottom of the article. One of them is "April Fools." I hope they take this down soon. It's an April Fools post, that said here's a question: If light gets trapped by black-holes and swallowed, wouldn't that mean that the force pulling them would be stronger than the speed at which it would normally go and in that regard that opposing force would be more pulling light or the absence of light at speeds faster than light? "If light gets trapped by black-holes and swallowed, wouldn't that mean that the force pulling them would be stronger/faster than the speed at which light photons would normally go?" Yes, because it would be in an environment of negative energy, no friction, no resistance; all matter is essentially just light condensed by resonant vibrational frequencies to produce mass, so the light would become a fiber optic pathway in which matter protected within a magnetic field could theoretically use to travel faster than the speed of light, in the same manner that data packets are sent in fiber optic communications. I don't think the relationship of force has anything to do with it. Since black holes are the opposite of photons in being essentially infinite mass vs zero mass,and the black hole does not directly act on the photon, but on space-time, and the photon is merely continuing its path through a distorted space-time. its like if an ant is traveling on a piece of paper you could oppose it with your finger, making it a contest, or you could alternately bend the paper to make it go where you wanted, and the ant is none the wiser. Black holes do the latter. I think of a black hole as what happens when matter is so condensed it overlaps on itself (we've done the same at nano-Kelvin temperatures with a few particles - just replace the the extreme cold with intense pressure from gravity). Think of having so much mass concentrated so that its gravity causes it to fall in on the very space containing it - infinitely overlapping any additional matter it comes into proximity with. Around this singularity are horizons where unusual phenomena occur: an event horizon and an inner horizon. These I consider "space quakes" due to the infinite folding of space around a point. Perhaps the reason light does not escape a black hole is simply because normal space (required to propagate light) ends at the singularity, and the zone where we see the change (the event horizon), which we associate with the "size" or dimension of the black hole, is just a phenomena - just the way it looks to us from the outside - disappearing at the edge of the singularity's influence on the surrounding space. I probably should not have used the term "quakes" as they are things which propagate. Perhaps a better term is "warp". A black hole doesn't grab and pull light at all, so it's force is not 'stronger' than lights speed. A black hole simply bends space into an infinite loop. So light isn't pulled in by some force, but simply follows the bend in space, which happens to be infinite. In effect, you could probably almost say that when light crosses the event horizon, it ends up in an 'orbit' of sorts around the black hole, infinitely following the path of space that the black hole creates. Whether that path be a circle, or as the above suggests, folds. Everyone knows, there is a way around this speed barrier. It's called "The Flux Capasitor." The light was not travelling in a vacuum nut in the atmosphere. Did that slow the light down more than the neutrino? Ah, but remember El Barco!! Don't forget, the Falcon will make .5 past light speed. I've been reading too much legit science news lately, because I read this comment and the first thing I thought was, "wait a minute, that can't be right. When did Space-X announce this? What did I miss?" Doesn't anyone bother to dig deeper and click the green links in the text? They obviously did not refill their blinker fluids. Happens all the time. Particle hit the speed of light, considered by Einstein a "cosmic constant"
The reason that the speed of light is not affected by the speed of it's carrier (compare to pitching a ball from a moving car) is because NOTHING is actually moving. That's right. It's because waves don't MOVE, they PROPAGATE through a medium. When you hear someone speak, it is not the same molecules excited by their lips that reaches your ears - and if they were approaching you in a speeding car, their pitch would shift, just like red and blue shift with moving light sources. Tie a rope to a wall and snap a wave at the free end. You will see it travel down the rope toward the wall...but the rope is not moving toward the wall. You are observing a DISTURBANCE in amplitude that is PROPAGATING along the rope. You are watching moving crests, which are actually different parts of the rope in separate increments of time. 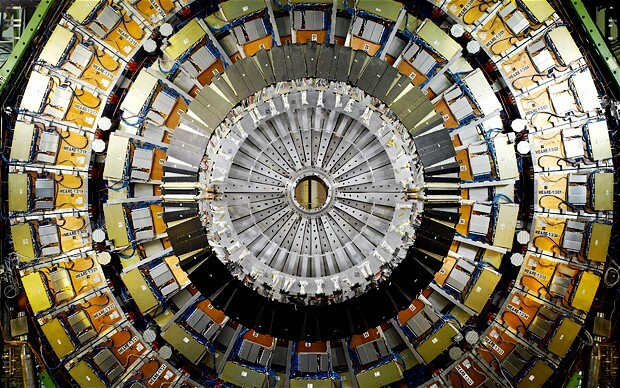 ► SO what then is a photon? (remember it is treated to have "zero" mass). I believe that a photon is the particle representation (manifestation) of the energy of the disturbance in an electromagnetic wave - to the tune of E=mc². It's the "m" in the equation, where "E" is the energy of the photon by Plank's formula E=hv, where "v" is the frequency of light, and "h" is Plank's constant 6.626(10)^-34 Kg m²/s. ►So, although we consider the mass of a green light photon to be zero (perhaps because it it one half of one ten-thousandth the mass of an electron) it meaningfully related to the equivalent mass, by Einstein's and Plank's formulas, of the energy of a DISTURBANCE in the fabric of space which PROPAGATES at the speed of light. Very astute observation, Domenico. And of course you are quite right. Excellent math! Thanks for the equations!! Could the Neutrino represent a boundary condition for Gravity? There is actually a summer kids camp which shares new scientific developments as fuel for world building and creative endeavors (original art, music, dance, writing. www.campdemigod.org a nonprofit children's overnight camp in Leavenworth, WA NASA award winning STEM+ARTS+MOVEMENT curriculum Camps look at the science behind Dr. Who, Harry Potter, etc. We discussed CERN a few summers ago. "Much science-fiction literature is based on the idea that, if the light-speed barrier can be overcome, time travel might theoretically become possible." Just like we're now able to hear what people are going to say ... before they say it because we broke the sound barrier? Let's suppose a gun is travelling at the speed of light what will happen to it's bullet when the trigger is pressed? Remember the gun is already travelling at the speed of light this so called speed limit. BUT the bullet will have to travel even faster as the speed of the bullet exiting the barrel is travelling faster than the gun. You have to account for time dilation and the increase in mass of the gun and bullet. By time dilation theory, there would be no bullet ejected as the time needed to burn the powder would be near infinite. By increased mass theory, the mass of both the gun and bullet would be near infinite and therefore the burning powder would never be able to create enough pressure to push the bullet from the cartridge, much less from the gun's barrel. With later in the presentation an explanation of how the speed of light and force of gravity may be without limits. We need to keep in mind, that our mind in 3D conditions is a limited mind, without the ability to jump out of that box. It's as Albert Einstein said "We can't solve the problem that is created by the same mind with which we try to solve it" See what I mean? Correction quote Einstein: "We can't solve the problem with the same mind with which we've created it" Slight difference of nuance. you fools, there is no such thing as a "speed of light", its a RATE OF INDUCTION and limit of transverse field phenomena. Law of conservation of energy. This law means that energy can neither be created nor destroyed; rather, it can only be transformed from one form to another. So...... when we die our energy goes somewhere. The squared velocity of a particle is reciprocal to it's rest mass, Photons have mass, and electron Neutrino have less restmass and therefore they go faster. Broken wire is all they found! Einstein wins again! I am not convinced yet, mostly due to the distance between cern and Sasso. I think it should be repeated using the moon - I am sure someone, NASA or ESA or another country would be willing to put a neutrino detector on the moon. Science is just another religion. Funny you should mention. Maybe you should see the study cern did on global warming before you say that. This is a universe of particles.Darkness is not absence of light,photons. Dark photons produces darkness emitted from dark star. Imagine a massive black hole giving off dark photons, they travel like miniscule black holes taking up energy from dark as they travel so they keep on escalating. Photons gives off energy,light and slows down eventually but this effect visible over very large distance. We recognize it as relativity as different photons slows at different rate. Escalating dark photons escapes our observation because they need darkness to be seen. How can we see dark in darkness? What about tangled particles? How do they fit in the question? They "communicate in some unknown way, much faster than light, as has been proven. The article is wrong: Einstein merely said that nothing can travel "AT" the speed of light and faster than light particles have long been postulated, they even have a name for them: Tachyons. 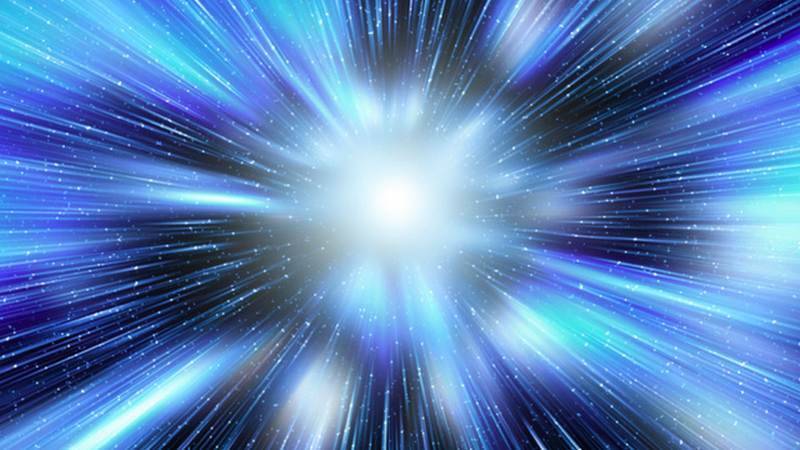 Faster than light travel is theoretically possible for this class of particles, though they also cannot travel exactly at the speed of light. I don't get it. How can the speed of light light be a considered a cosmic constant if it is decreased in a medium such as water as everyone knows. Something goes faster by a few nanonseconds, what's the deal? Maybe they just found a more accurate measurement of the speed of light.